Most travelers tend to pop into Phnom Penh just long enough to see the major sights, get the bejeesus scared out of them by the traffic, and move on. Not us. Ever the lazy, slow-moving hedgehogs, we spent 13 days there. Please note that this post is not part of the Ban Lung saga I've been telling over the course of, oh, the past year or so. Rather, it is the first chapter of an entirely different story. But if you trust me enough to read through to the end of this post, you'll see why that shouldn't give you any reason to fear. One of our favorite aspects of traveling is the "travel day" – those times where the entire day is more or less spent getting from one place to another. The two of us have been on some lengthy ones, like the time we spent about 40 hours getting from Salta, Argentina to Arequipa, Peru. We've been on exciting ones, like the time early in our trip when our bus nearly became a submarine. And we have been on one or two travel days where it seemed like everything was going wrong, like the time we spent 26 hours in Turkey making our way from Göreme to Fethiye. Beyond these three examples, we've had dozens upon dozens of travel days over the course of our adventures together, and have generally loved every single one of them. But none of them hold a candle to this one. 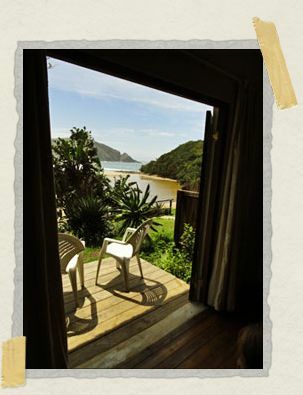 We've talked a bit about our stay at Bulungula Lodge, located on South Africa's Wild Coast. What we haven't described yet, though, is the day we spent getting there. Their website offers three options: self-drive, shuttle, or public transport. Self-driving was clearly not an option for us, given that we had chosen not to rent a car in South Africa. So really for us it was down to taking the shuttle or getting there via public transport. And here we were really swayed by the Bulungula website itself. 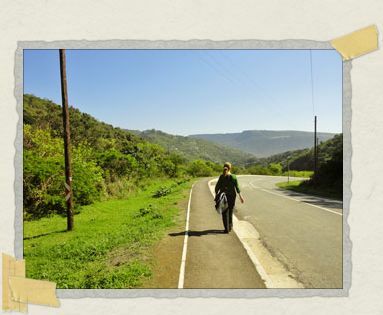 We believe that most backpackers in South Africa are missing out by not travelling around the country on local transport, it read. Not only are minibuses and non-tourist buses much cheaper and quicker but they are also often the best way to meet interesting people and to learn about local culture. 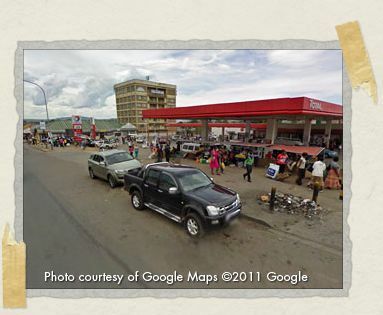 We recommend a crowded bakkie taxi filled with people, chickens, groceries and laughs over luxury transport any day. Well, we could hardly have agreed more with that sentiment. As a matter of fact, this passage was a major factor in convincing us that we really could travel in SA without renting a car after all – something for which we owe it a debt of gratitude. Coming by local transport is definitely the only way to appreciate the unique location of the lodge, the website continued tantalizingly. And then it ended with a challenge: In fact, anyone who arrives at the lodge by local transport from Mthatha gets the first night free. Well, how could we say no to that? 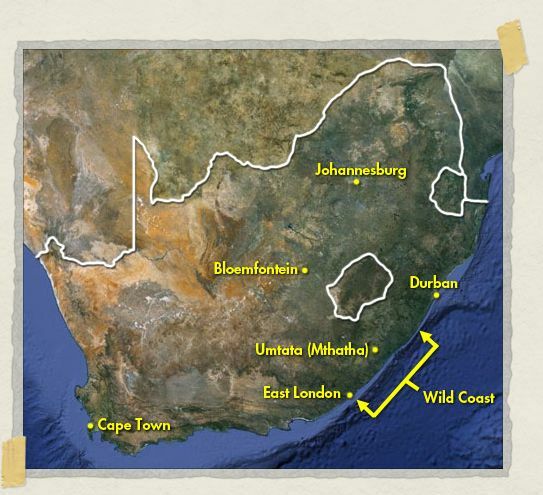 We're starting out from the idyllic seaside town of Port St. Johns, a mere 50 miles (80 km) from our destination as the crow flies. So it shouldn't take too long to get there, right? We awaken early in the morning in our lovely beachside room, and (owing to the fact that we packed the night before) manage to check out and hit the road in no time. A key factor here that you'll want to bear in mind for the remainder of this narrative: Jessica is sick. The poor girl has come down with a pretty nasty little cold, and feels just terrible. Most unfortunately, neither of us has any idea of just how epic this travel day is going to be. If we did, perhaps we'd have given her more time to recover first. As it is, she is an absolute trooper, and will not once mention how awful she feels until the day's adventures are over and she can rest at last. But all of that is a long way off. We're only just now heading out the door. We've been staying at what is known in Port St. Johns as "second beach," which is a good 45-minute walk or so from "first beach" and the center of town. Fortunately, we have by now mastered the art of the minibus taxi, and don't think we'll have to walk all that long. Unfortunately, today is not our lucky day. Despite the fact that on any other day we'd be passed by a dozen taxis during our walk into town, today we see not a single one. Maybe it's too early? We get passed about eight times by a "driving school" car that's making its way down and back over and over, teaching somebody the finer points of driving as the sun creeps higher into the sky. In the end, we have to walk the whole way into town, which wouldn't be a problem except that we're trying to keep to a bit of a schedule. Our schedule takes another hit as we reach the outskirts of town and pass an internet cafe. Knowing that for the next few days we're planning to be out in the absolute middle of nowhere, we pop inside to fire off a couple of emails. In addition to letting our families know we're safe and sound, we also want to make sure to wish Jessica's dad an early happy birthday, under the impression that we won't be able to call the States from Bulungula. (Somewhat surprisingly, we will in fact be able to call him from the lodge, borrowing one of their solar-charged cell phones to do so.) Perhaps most importantly of all, we also post a very special story, one that Jessica wrote a little while ago, but which needs to be posted today. Our errands wind up taking us a little longer than we'd planned, but soon enough we're back outside again, continuing on our way into town. And so it is that despite leaving our room bang on time, we're already running a bit late when we finally trudge into the center of Port St. Johns. As usual, it's a chaotic kaleidoscope of frenzied activity, and we weave our way through the throngs into the supermarket to get some supplies for the road. The peace and quiet of second beach suddenly seems very far away indeed. We grab some savory pies to munch on – chicken and mushroom for Jessica, and a delectable mutton and curry for me – and some water and fizzy drinks for the ride. On our way out, we also make sure to buy some tissues for poor sniffly Jessica, and then make our way back out to the line of minibus taxis. 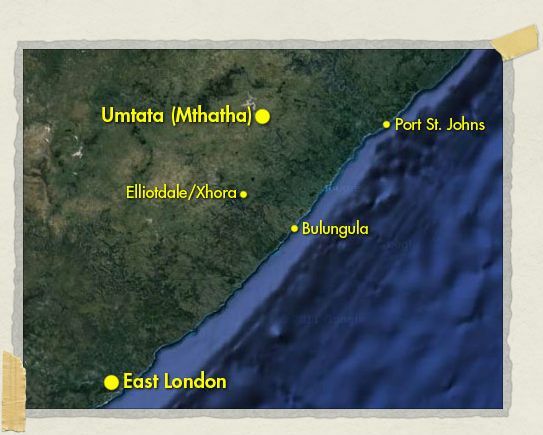 We scoped out this area yesterday, and so we know exactly where to go to board a taxi headed for Umtata – our next destination in today's adventure. We pile into our minibus taxi and wait for it to depart. South Africa's shared taxis don't leave until they're full, but to this point we've been lucky and have never needed to wait more than a few minutes. Today, though, is of course a different matter. There's a reason we're feeling a little bit of a time crunch – a reason we'll get to later, but for now just remember the word eskepeni – and so we start feeling a little antsy as the minutes drag on. Ten minutes, then twenty. Then thirty. By the time forty minutes have passed, we and everyone else on our taxi start to get really excited whenever anyone approaches looking like they might join us. There are only three seats left, we're all thinking, and here come three people together! Oh please oh please oh please I hope they're coming over to our taxi! But no, invariably, they aren't. After nearly an hour has passed, we're finally full to capacity, and the driver appears out of nowhere to start up the engine. Not long afterwards, we're off! 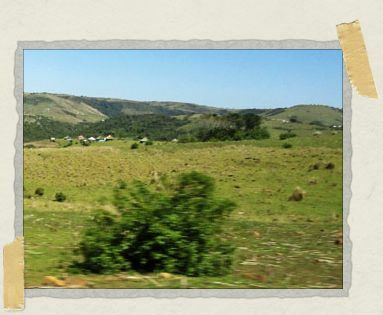 The countryside of the Wild Coast is just breathtaking, all low green scrub and endless rolling hills dotted here and there with rondavals. As is my habit, I fall asleep almost immediately, soothed from consciousness by the gentle, chilled techno the driver is playing. For her part, Jessica soaks in the beautiful landscape flowing past outside the window, complete with schoolboys in long-sleeved yellow button-down shirts playing epic matches of soccer under the late-morning sun. Both of us are hoping (well, I am when I'm awake anyway) that our taxi won't break down like the one that we took from Umtata to Port St. Johns a few days ago. On that occasion, we all heard this sickening crunch when something went wrong as the driver changed gears, and after a few moments more he had to pull over to the side of the road. He climbed out, pulled out a wrench and a pair of pliers, and set about dismantling the clutch while we waited. Eventually we flagged down another taxi to take us the rest of the way. Fortunately, our luck holds, and we don't break down today. 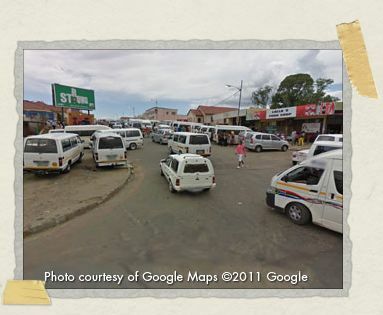 Eventually, we rumble into our taxi rank in Umtata. Phase one of our journey is finally complete. Me: Do you know which taxi goes to Elliotdale? This continues for a minute or two, as all of the other passengers collapse into laughter. Eventually, though, Jessica suggests that I try asking about "Xhora" instead (because the instructions referred to it as "Xhora/Elliotdale"). The fact that we're able to click correctly when each of us says it (the letter "x" in the Xhosa language is a clicking sound) comes as such a surprise to everyone in the taxi that they all collapse into several minutes of renewed laughter. After that, though, we begin to make some progress. The big guy thinks he knows how to get us to Xhora/Elliotdale. He gets out of the taxi and motions for us to follow him over to a parked police car (and because he's taking us over to a cop instead of into a dark alley or something, we follow him). They have an animated conversation in Xhosa, and then the big guy comes back over to us and asks if we have a pen and paper he can use. Curious, we hand him our pen and the little notebook we're using to record our daily expenses (our little "memory notebook" for this trip). 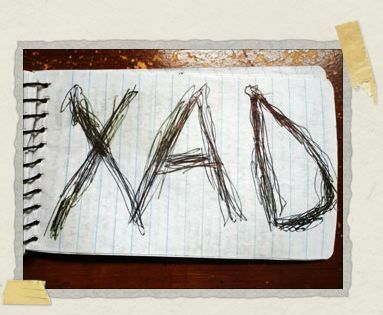 He takes them back over to the cop, who writes something down with a smile. Our big friend lumbers back over to us again, and we can see that the police officer has written three letters, which he is now tracing and re-tracing to make them darker and more visible. With a great big smile, he hands us the notepad, and says that it's what we need to hitchhike to Xhora. He just wants to grab some lunch, and then his friend will arrive to pick him up. He says he'll be happy to have his friend drop us off at the hitchhiking spot, where we can hold up our sign for all the passing cars to see. Then the next person headed to Xhora/Elliotdale will pick us up and take us there. We're a little unnerved now. The instructions on the Bulungula website mentioned a minibus taxi, not hitchhiking. And even just getting to the "hitching spot," which would involve getting into a private car with two people we don't know, is just not something these two hedgehogs are comfortable with. And so, as grateful as we are for his help, when our big friend pops into a fast-food shack to grab his lunch, we scamper. After putting a few block between him and us, we take a moment to reexamine our situation. We're now several hours behind schedule, which is particularly a concern because we're worried about the eskepeni. (I'll explain what an eskepeni is in a bit). Moreover, we have absolutely no idea how to get to our next destination. And remember, Jessica is sick. Oh, and it's starting to look like it's going to rain. After a bit of a walk, we find ourselves once more at the taxi rank up above the supermarket, where we ask directions from the friendliest, jolliest taxi driver in the world. After a bit of polite smalltalk, he directs us with an enormous smile to yet another taxi rank, over near the Boxer superstore, and suggests we might have better luck there. Following his instructions, we make our way down Eagle Road, which is indeed completely choked with parked minibus taxis – hundreds of them. One of the first ones we pass is being vigorously washed by its driver, so we approach him and ask if he can direct us to the taxi to Elliotdale. As with the first driver we asked, he seems to have no idea what we're talking about, so I quickly switch to asking about Xhora. A moment later, something happens that has never happened before, and will never again occur during any of our travels in South Africa – two other white people board the taxi. They sit down in the row in front of us, and after a moment they turn around to look at us with curiosity. All four of us point at each other and simultaneously ask the same question – "Bulungula?" And so it is that we first chance to meet our friends Peter and Loes. They will be our companions for the remainder of this epic travel day. None of us know what a marvelous adventure we're about to embark upon. Now, given the pace at which I've been spinning my tale about our arachnophobic adventures in Ban Lung, you could be forgiven for getting a little nervous right now. But have no fear – this time, I've already written the rest of this post, and so can promise you that Part 2 will be up very, very shortly. And it's where things really start to get interesting, once we finally do venture off the beaten path. love the yarn-spinning and the cross-lingual comedy – do not love sicky hedgehogs, even in retrospect. Yeah, she was a real trooper – the poor girl was feeling so much crappier that day than she ever let on to me until after it was all over. Glad you enjoyed the post! Part 2 should be up in the next couple of days or so! I just posted it a couple of minutes ago. Enjoy! Great story – I couldn't hope for a better explanation of why we encourage public transport! If it's ok with you – can I link to this from our "Public transport" section? I've also sent an email to your @hedgehogs email address. Hi Dave, it's great to hear from you again! Sorry we didn't get back to you sooner – we were traveling when you posted your comment, and I've only just noticed it now! Fingers crossed that perhaps our post might help convince someone reading it to get to Bulungula via public transport – that journey really was one of my favorite memories from any of our travels! You mentioned emailing us, but I'm sad to say we never got your email. (Our spam filter was getting a little overeager there for a bit, and is probably the culprit.) When you get a chance, please do try again, we'd love to hear from you!